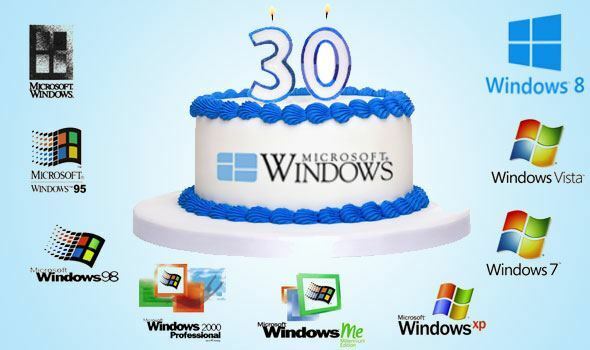 It’s more like 20 for me actually, but I’m writing this to celebrate Windows’ 30th anniversary. While Apple and the Lisa introduced the world to the GUI, it was Microsoft Windows that helped the world embrace it. Windows 1.0 was first introduced in 1985 but never gained traction. It was a novelty at best and it would be 10 years before I could actually get to use Windows. It’s Windows’ 30th anniversary and I thought I’d write a short personal history of it. I’ve been using Windows since college starting with Windows 3.1, the same version that would propel Microsoft to become the world’s top software company. It was hard to think of 3.1 as a version number back then as for me it was more part of the name. Not many people actually thought of versions 1 and 2. I only got to try Windows 1.0 recently emulated on some website. Google it if you want a go. Actually, my first experience with the graphical user interface was with DOS 5’s Dosshell. Back then I didn’t really know what it was but it was cool and it made DOS easy to use. I started using computers as an extra subject back in high school and got my own PC when I graduated to college. It was a PC-AT compatible with an AMD 286-compatible processor, a 40MB hard disk, the standard 640KB RAM complemented by an extra 1MB extended RAM on a card. Compared to my university’s computers, mine was fast. But by then PCs with the Intel 80386 processors were already out and so was Windows 3.1 which came out in 1990. I saw those in back issues of Byte and PC Magazine and was actually salivating to use Windows. I got a Windows PC on my 3rd year in college and it was cool. I loved to draw and write so I quickly maximized the use of Write and Paint for my studies and spent hours trying to beat Solitaire and Minesweeper in under 30 seconds. Those were the times. By my fourth year, Windows 95 was out and had the opportunity to use it through a pretty classmate who just bought her own PC, a 486-based computer with 4MB of RAM. I visited her often to use Windows 95 doing our thesis, among other reasons. It was my first taste of the Start Menu which organized the cluttered desktop of Windows 3.1. The interface was cleaner and more sophisticated. We developed our thesis using Foxpro for Windows which came out beautifully on Windows 95. As for Windows 3.11, otherwise known as Windows for Workgroups, I only got a glimpse of it running on our university’s file server but I saw a lot of it after graduation. I had to endure the archaic style of Windows 3.11 when I started working as it was the company OS as we of course needed to be networked. My long stint with 3.1 meant that 3.11 was a breeze and my experience with GUI-based development during my college thesis made it easy for me to get hired. There were only three of us that year who developed Windows-based programs for our thesis. Eventually, we graduated to Windows 95. I did some small jobs before my second regular job and it was then that I appreciated Windows 95s new features such as USB support and Plug n Play after it had a major update prior to the release of Windows 98. We affectionately called it Windows 97. My second regular job got me using Windows 98, which came out in, 1998. It was the same as Windows 95, except it was more integrated with the fledgling internet. Windows 98 also had better USB support though there were still a ton of non-USB devices going around. It also bundled Internet Explorer, which got Microsoft into a great deal of trouble. Bundling Internet Explorer resulted in antitrust cases as the company had an unfair advantage over the competition, particularly Netscape. Why buy a browser when it’s already on the operating system? Windows XP came out in 2001, and our company skipped Windows Me otherwise known as Windows Millennium Edition which was a disaster for Microsoft due to its high level of instability. I envied the company’s XP users as I was stuck on Windows 98 for a couple more years until we were sure our sensitive Payroll software would run on it without issues. Meanwhile, our company was using Windows NT as our server operating system and was off limits to us developer grunts. I read up on it even before graduating college. My first actual foray into server operating systems was when I had to set up Microsoft’s Sharepoint on a Windows 2003 server. Unfortunately, I never got to finish the project when I moved to a new consulting job but I got to use Windows XP and Windows Server 2003 a lot. Now Windows XP did prove to be a lot more stable as I kept crashing my Windows 98 PC in my last job. Thankfully fewer BSODs and a prettier interface. Now back then, Windows XP wasn’t the slow, bloated operating system it is now as it ran happily on a Pentium 3 IBM Thinkpad laptop with 256 MB of RAM. At the latest, it would crawl on a 1GHz Core2Duo with 1GB of RAM. Microsoft pulled the plug on XP last April 2014. I would use both Windows XP and Windows Server 2003 for years to come. PDAs were the rage during my second job. It was the time of the Palm Pilots. Microsoft, of course, followed up with Pocket PC, which would later become Windows Mobile. Apart from my Handspring Treo 180, I got my hands on an HP Ipaq. Windows on such a small screen was awkward as well the memory management. I stuck with the Treo instead. The rise of Blackberry was writing on the wall for Palm and Windows Mobile. The launch of the iPhone killed Windows Mobile. I still keep my Treo 680. I’ve been reading up on the Windows XP follow-up Project Longhorn while in my third job. Microsoft, who has so far been following Moore’s law, came up with a follow-up version every two to three years has been late to follow up on Windows XP. At long last, Windows Vista came up but was a big disappointment. One, our company didn’t implement it as its hardware requirements were expensive at the time and two, its hard-to-deal-with UAC and lousy backward compatibility with older peripherals meant it was unsuited for our use. I skipped using Vista altogether and only encountered it on some laptops in my most recent job. Windows 7 came out in 2009 which was, as everybody says, what Vista should have been. I got to appreciate it fully in 2010 and still use it as the office operating system, only because it’s a requirement as most of our software runs smoothly on it. When Windows 8 was announced in 2012, I was with it from the start. From the earliest developer’s preview until the final build. I replaced my Windows 7 laptop with my ASUS Vivobook, which initially ran Windows 8. Windows 8 was new, Windows 8 was fresh, you could say I’m one of the operating system’s very few fans. Windows 8 was a different beast which I considered a departure from all the icon grids I kept seeing on older Windows versions, Linux, iOS and Android screens. The interface was pulled from Microsoft’s Windows Phone 7. I was completely fine without the Start Menu as, under the hood, it felt fast and optimized. Compared to Windows 8, I felt like Windows 7 just crawled along. I’m a power user myself and like many had to get used to a new way of doing things. It was basically Microsoft’s attempt at bringing together desktop and tablet functionality in one package. The majority of users, of course, hated the change, and it seemed to have exacerbated Microsoft’s dilemma of being late in the mobile game. 2012 practically spelled the proverbial end of the world for Microsoft as the dominant authority on desktop operating systems. The PC is dead and all that. But honestly, I never liked Charms. Never gave up on Windows 8 but I had to upgrade to Windows 8.1 when it came out on 2013 to keep up with the changes. Still no Start Menu though it calmed many people when the Start button came back along with a few other improvements. In fact, still using Windows 8.1 on my HP Stream 7 as I find 8.1 fast and perfect. My Vivobook has Windows 10. Like Windows 8, I followed Windows 10 closely as you could glean on previous articles. I’m currently time and strapped of bandwidth so I haven’t upgraded to the latest build which is 10586. Now Windows 10 brings back the Start Menu which I honestly feel is inferior to Windows 7. The addition of a dedicated search box on the task bar is a cool idea and Cortana for me, like iPhone’s Siri is a passing fling. Windows 10 unfortunately boots slower than Windows 8, or it could just be my old notebook. I also bought a powerful i7 Lenovo laptop for my boss loaded with Windows 10 but to be honest doesn’t feel as fast as it ought to be. Right now, I support a mix of Windows 7, Windows 8, Windows 8.1, Windows 10 and Windows Server 2008 systems. I’ve dabbled with a few Linux distros, tried Android on a large HP Slate but still couldn’t recommend them for real work among my colleagues. I did install Linux on their old home computers and taught them a few moves and they tell me they still feel limited. Windows still rules on the workplace and in homes without Macs or iPads. My Windows 10 experience has so far been okay, but hopefully Microsoft could bring back that fast, optimized feel I got with Windows 8. Then Windows 10 would really be a blast. Microsoft seems to have gotten its act together with hits like the Surface Pro 3, Surface Pro 4 and the Surface Book so if they want to stay where they are now, a few more improvements to Windows 10 are in order. No doubt there will be as Microsoft says that Windows 10 is the last Windows version. Updates and tweaks will come through Windows Update. The world has been with Windows for 30 years now while I’ve been with Windows for 20, and would probably be for several years more, that is, until Microsoft or someone else comes up with something comparatively better.